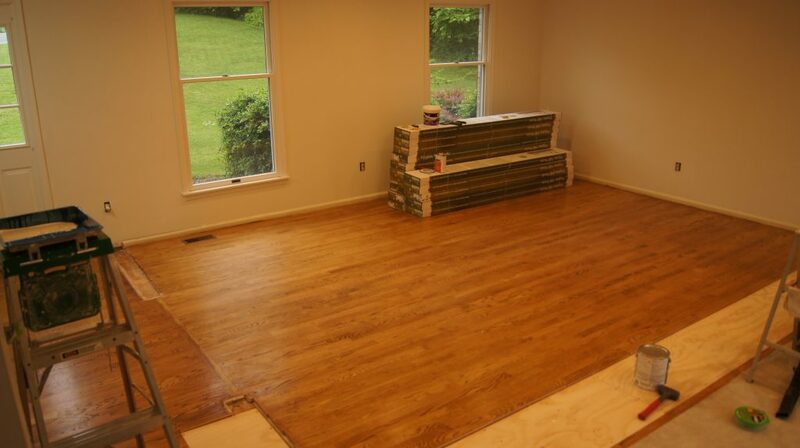 This would have been an easier job if I weren’t particular about our flooring. There I go, making things difficult again. 🙂 The existing wood flooring in the formal living room area was still in pretty good condition, but my need for consistency won over the opportunity of reusing or refinishing. 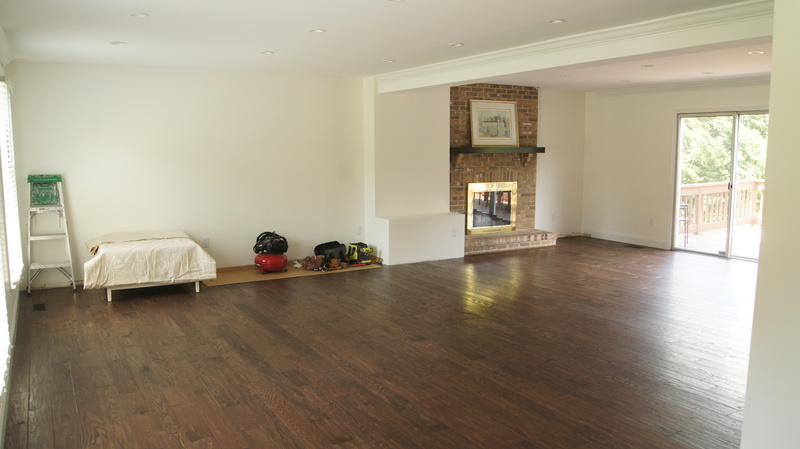 The carpeted area in the family room was trash from the day we moved in. 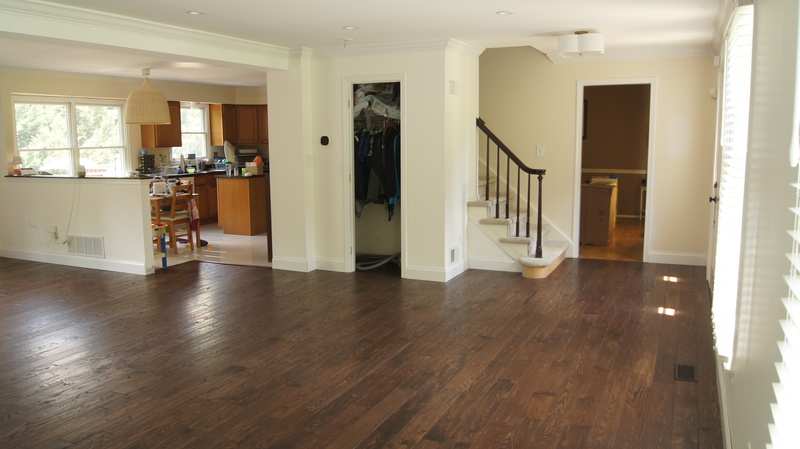 It had a huge stain on it in the main walkway from the previous owners, and it was always embarrassing to have someone over and see them look at it. Actually it’s really two words: “Nickel Gap”. So what’s the difference, and why does it matter? Well, technically shiplap is a type of board with a rabbet joint which allows the boards to overlap. 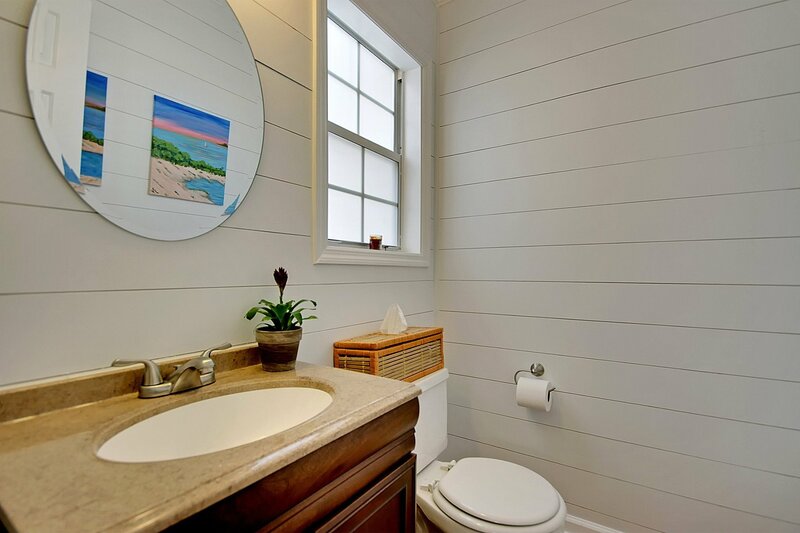 The bathroom above did not use real shiplap, but it essentially looks like it. Instead we used a method called “Nickel Gap” which is simply spacing the boards the width of a nickel. This method is more time consuming, but can be done for significantly cheaper and yields a similar result. For the boards, we used 5mm plywood, which is about as thin as plywood comes. At about $13.50 for a 4’x8′ sheet, you can really make a room interesting for cheap. We bought 5 sheets at Lowes and had them cut in-store to 6″ wide strips lengthwise. I think the guy who did the cutting probably still breaks out into a cold sweat when he hears “Customer assistance needed in the board cutting area… bing bong… board cutting area.” I don’t know if they have rules about a number of cuts they’ll make per board, but he did seven cuts for us. He cut all five of the boards stacked, which definitely saved time, though. I could have cut the strips with my table saw, but I never would have been able to cut them as straight and even as in the store. I grew up as a total cheapo. My family made fun of me for everywhere we went I always claimed that I “forgot my wallet.” I’m sure this has some crumb of truth in it, but I won’t give them that satisfaction to fully admit to it right now haha. Now that we bring in steady paychecks and can live comfortably, and aren’t struggling, broke college kids, we’ve definitely loosened up on our spending habits. At heart though, I’m still a cheapo. 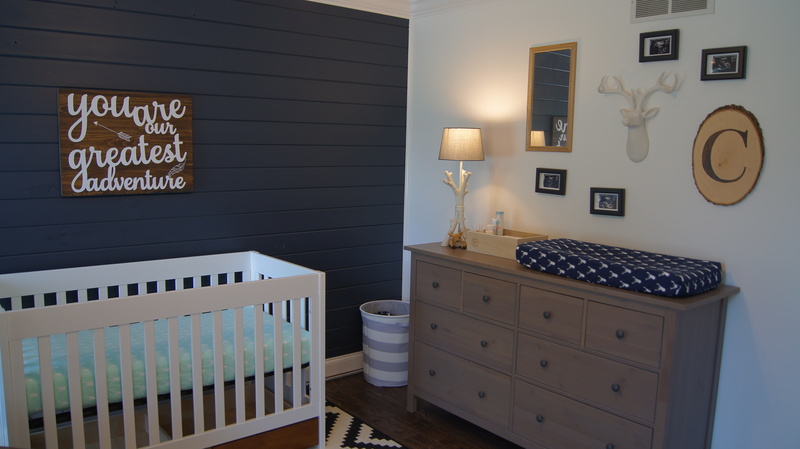 I had a lot of ideas for the nursery, that big box stores don’t typically sell. They’re more the types of decor that you find on Etsy. As much as I appreciate supporting someone to do that type of work, some of the prices are crazy. So I researched and pretty much decided that I would do them all myself. 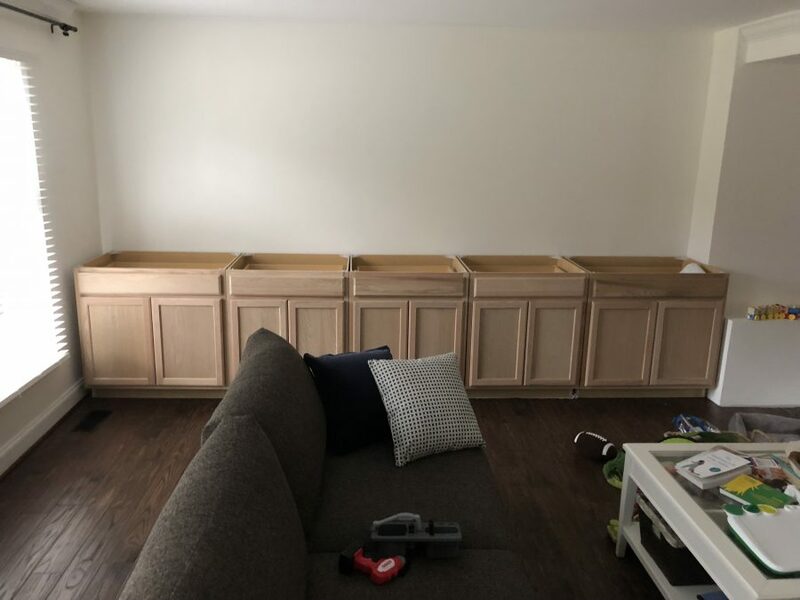 Check out Part I of this post to see the building of these shelves! We wanted a dark wood stain for the shelves. We’re a little atypical with painting and staining in that (except for walls and ceilings) we apply finishes to everything before the final install. It just makes it easier to pull together the final project without worrying about taping and touching up already painted walls. This means I had to deconstruct the shelves for staining and mark each piece inconspicuously with it’s location so I could rebuild it easily. It’s extra work, but we think it’s worth it in the end for a high quality finished product. We’ll probably write a blog about our reasons one day. Carolyn did all the staining and top coats because she’s way better at finishing touches than I am. In case anyone is wondering we used Minwax Dark Walnut for our stain color. 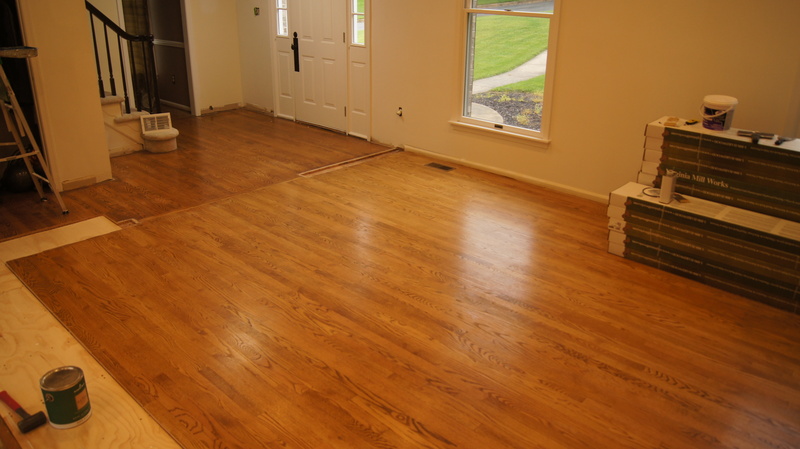 It very closely matches the hardwood flooring color we chose for the house. Just look at this beauty… and the stain looks pretty good too! Let’s face it, sometimes houses have weird, little nooks that make you wonder what the builder or contractor was thinking. We have one in our basement. 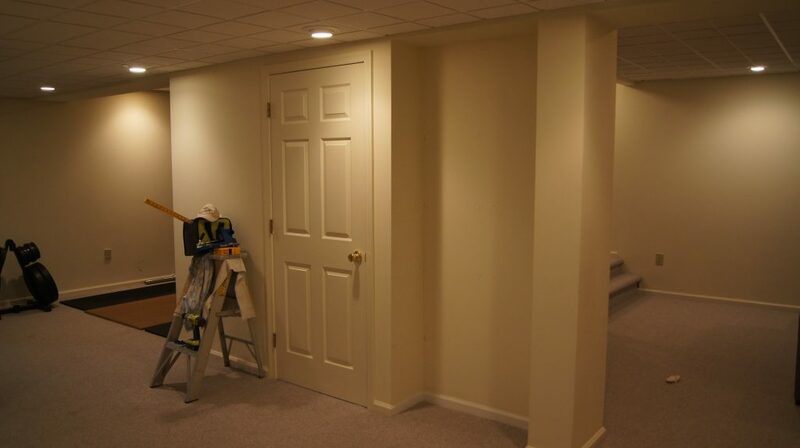 One of the previous owners had the basement finished and created a strange cavity between a support post and a closet. Ever since we first looked at it, we thought “That nook needs some shelves.” Our plan for this section of the basement is to make a bar area, so we thought the shelves would be a good place to store the growlers we’ve been collecting from our favorite breweries. We also inherited a TV from my Dad. It’s the only other TV we have besides our projector, and its on the smaller side, so we figured the shelves will also be a good place for a TV. A bar needs a TV, right? Carolyn found some “pinspiration” from these shelves, but couldn’t find a tutorial, so we decided to improvise. She loved how they had a slight rustic, but built-in look to them, without actually cutting into the walls. First, we measured everything and decided how many shelves to build. We decided to go with four shelves, which would comfortably fit the growlers and the TV on top. 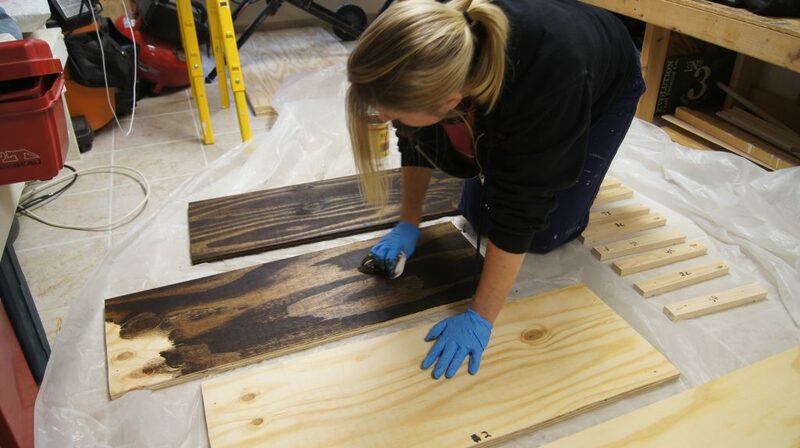 We went to Lowe’s and looked at the standard size pine boards and decided that it would be much cheaper to buy a sheet of 3/4″ plywood and cut it into sections for each shelf. I had them cut the shelves to an approximate size because we brought our smaller car that day. I over-sized the cuts by 1/2″ in each direction because although their cuts are super straight, their measurements aren’t always accurate in the store and I could easily do the final trimming at home. 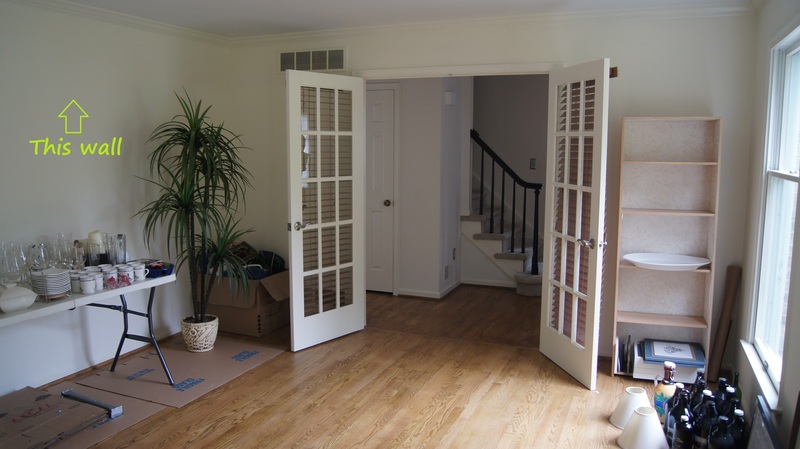 If you don’t have a table or circular saw at home, you can have Lowe’s do all the cuts for you, but you’ll want to double-check the measurements before and after cutting. Our design was a floating shelf so we wanted to see as little support or screws as possible. To hide the screws I used pocket-hole joinery, a technique used in woodworking to join pieces of wood together with a screw drilled in at an angle. The screw can even be covered by a wood plug. This was a perfect practice project for the Kreg Jig Kit that Carolyn bought me for Christmas. The Kreg Jig is a tool to make pocket joinery simple. The kit she got me is amazing and is a bit of overkill for this project, but I plan to do a lot of built-ins with it in the future. Kreg has plenty of jig options to match any budget. Even the Mini Kreg Jig Kit could get this job done. No, our tiny blog is not sponsored, I just really love their tools!